Tue., July 3, 2018, 12:30 p.m.
Sgt. Jacklyn Davis, a spokeswoman for Anne Arundel County police, said the letters were received Monday. They were mailed to an attorney for the Capital newspaper, a retired judge of the Maryland Court of Special Appeals and a Baltimore judge. The letter Jarrod Ramos sent to the Annapolis newspaper’s Baltimore-based lawyer was written to resemble a legal motion for reconsideration of his unsuccessful 2012 defamation lawsuit against the paper, a columnist and then-publisher Tom Marquardt. Marquardt shared a copy of the letter with the Associated Press. “‘That is how your judiciary operates, you were too cowardly to confront those lies, and this is your receipt,” Ramos wrote. In a letter attached to what appeared to be the faux court filing, he also directly addressed retired special appeals court Judge Charles Moylan, who decided against Ramos in his defamation case. Ramos sued the paper after pleading guilty to harassing a high school classmate. Douglas Colbert, a University of Maryland law professor, described the letters as “very powerful” evidence of intent that the state will make full use of at trial. Colbert said as long as it’s established in court that Ramos authored the letters, they will be used to show his “planning and deliberate actions” on the day of the attack. The apparent admissions by the defendant will weaken a defense lawyer’s strategy of suggesting that he was “suffering from a mental disease or defect” that would impair his ability to understand the consequences of his actions, Colbert said. Ramos, 38, has a well-documented history of harassing the paper’s journalists. The defamation suit was thrown out as groundless, and he often railed against current and former Capital staff in profanity-laced tweets. Police found him hiding under a desk after Thursday’s attack and jailed him on five counts of first-degree murder. At a memorial service Monday night for one of those killed, editor Rob Hiassen, Marquardt said he once slept with a baseball bat by his bed because he was so worried about Ramos. He also said that they “stepped up security” at the newspaper years ago, and posted Ramos’s photo around the office. “But then he went dormant for about two years and we thought the problem has been solved. Apparently, it was just building up steam,” he said. The mourning in Annapolis continued Tuesday, marked by a lowering of U.S. flags to honor the victims. President Donald Trump ordered flags flown at half-staff on federal property through sunset. Annapolis Mayor Gavin Buckley said Monday that Trump, who has repeatedly called journalists the “enemy of the people,” said he had been told his request to lower the flags had been denied. The White House said Tuesday that Trump ordered the flags lowered as soon as he learned of the mayor’s request. Buckley expressed frustration Monday afternoon when he was told by a Maryland congressman’s office the request had not been granted. He said he considered lowering flags on his own, but decided to follow protocol. He said he received a call from White House Press Secretary Sarah Huckabee Sanders just after 11 p.m. Monday, asking him for confirmation if he personally was making the request. 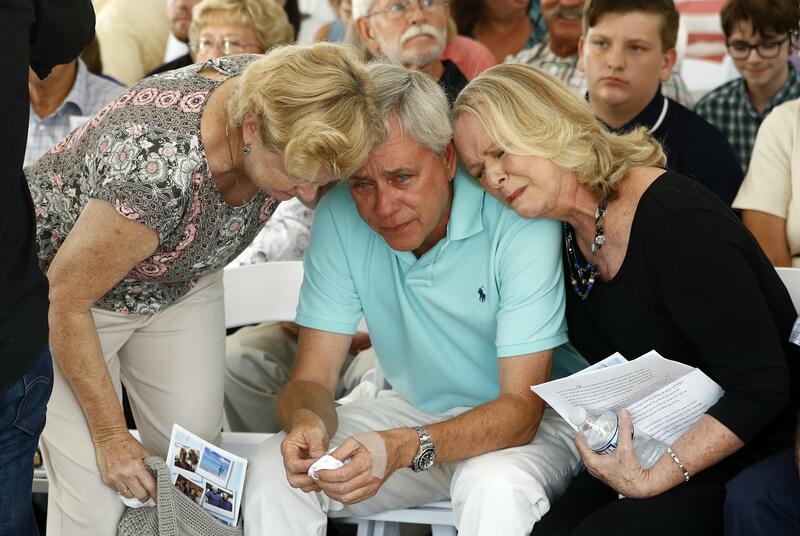 Hiaasen was remembered Monday evening in stories, poems, prayers and songs at the “celebration of life” ceremony Monday evening. He was fatally shot last week at the Capital Gazette along with colleagues Gerald Fischman, John McNamara, Rebecca Smith and Wendi Winters. Published: July 3, 2018, 12:30 p.m.